In the spirit of celebrating our anniversary early and often, Clif and I have decided to have a little staycation, of sorts, and do something special every day until our anniversary on March 19. And what did we decide to do yesterday? 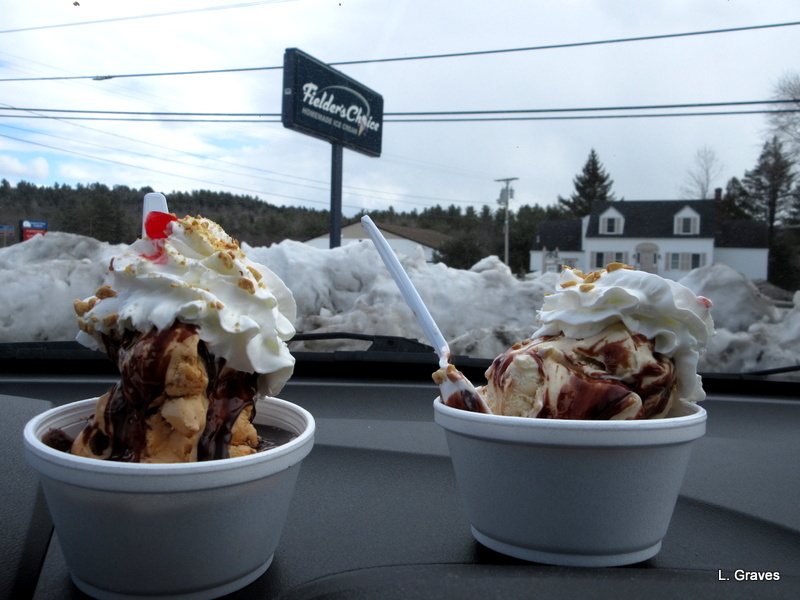 Why go out to an ice-cream stand, of course, and have sundaes for lunch, even though the wind was whipping and the air was uncomfortably brisk. We went to Fielder’s Choice in Manchester, which has very good ice cream, and we weren’t disappointed. My peanut butter ice cream was smooth and flavorful, and Clif’s butter finger ice cream had huge chunks of candy in it. Still, only northerners would think it was a good idea to go get ice cream when it was bitter cold and then eat in the car. Definitely a silly couple! 😛 But I have a feeling that you weren’t the only one with the same idea! So true! We weren’t the only ones there. Today’s trip will be a little warmer—we’re going to a talk at the Colby Museum of Art. So true! And the ice cream is so good at Fielder’s. Thanks, Eliza. Just a couple of crazy Mainers. Great idea, Laurie. I’ll have to remember it in November when our 56th comes around. The sundaes look delicious. Wow! Fifty-six years! Happy, happy!